Why North Yorkshire? Well…..many years ago – back in the early 1980’s actually or even late 1970’s, I stumbled across the book “All Creatures Great and Small” by an English (well, actually Scottish!) veterinarian! His name was James Herriot, and he came to the Yorkshire Dales to accept a job as assistant to a character of an older veterinarian who had need of same. It was his first job out of school, and he ended up spending the rest of his life there. He was completely charmed by the people (well….most of them! ), his patients… after all…what’s not to love if you are a veterinarian! And, principally, the stunning beauty of the countryside. The older vet who hired him had a younger brother who was at the time studying (well…sort of!) to be a veterinarian. And after a number of years, James Herriot decided to write about his experiences, the escapades of the three of them together as the best of friends ultimately, his work, and his love for the amazingly beautiful country in which he was practicing. I read ALL the James Herriot books and there were a large number of them. And then to my great delight, a television series was made out of the stories….broadcast first in England and then brought to the US and aired on PBS. It was filmed in North Yorkshire and, of course spent a lot of footage showing the North Yorkshire Dales and Moors – the area in which “Jim” (not his real name!) practiced! And then there was the wonderful book of photographs of the area taken by Derry Brabbs and published as “James Herriot’s Yorkshire!” The images were absolutely beautiful, and it was then that I determined to go there ‘someday.’ I initially visited the area with my husband, who died in 1986. Since that first visit I have been back over 20 times! WITH camera in hand, of course. Several years ago I even got to work with Derry Brabbs for several days. I stayed at his home – he and his wife were extremely welcoming, and I learned a lot from him about photographing the area effectively … and handling the challenges of such a varied and colorful landscape! 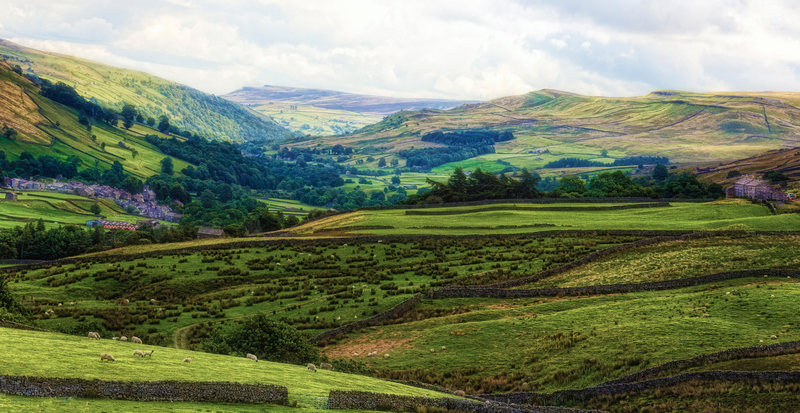 In fact, I have English and Scottish ancestry….so I’m not sure what is there for me…but I do know that from the very beginning every time I’ve gone there I feel as though I’ve ‘come home!’ There is something very deep and even mystical about my connection to Yorkshire! (Actually, it was in photographing the Yorkshire Dales that I first began to truly understand how to use my ‘eye’ and through that, communicate my sense of wonder at what I was seeing and experiencing!) I feel so fortunate that I have been able to capture some of that feeling with my camera! And why not!? …there is no more beautiful place anywhere! Yorkshire has it all! Perhaps you have to be there to understand that….and I hope that my photographs here and in the main site will help you grasp what I mean, even if for now you are unable to visit! But, it is true magic!! Enjoy! And, do read the books and find the videos if you are not already familiar! Next If A Tree Falls In The Woods, and No One Is There To Hear It, Does It Make A Sound?